In a small bowl, soak the dried mushrooms in the boiling water until softened, about 15 minutes. Remove the mushrooms and strain their liquid into a medium saucepan through a sieve lined with a paper towel. Add the broth to the mushroom-soaking liquid; bring to a simmer. Rinse the mushrooms well to remove any grit, chop them, and set aside. In a large pot, heat the oil over moderately low heat. Add the onion and cook, stirring occasionally, until translucent, about 5 minutes. Add the rice and salt and stir until the rice begins to turn opaque, about 2 minutes. Add the wine, the 1/4 cup cognac, and the chopped mushrooms. Cook until the liquid has been absorbed. Stir 1/2 cup of simmering broth into the rice and cook, stirring frequently, until the broth has been absorbed. The rice and the broth should bubble gently; adjust the heat as needed. Continue cooking the rice, adding the broth 1/2 cup at a time and allowing the rice to absorb the broth before adding the next 1/2 cup. 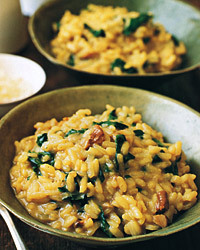 Cook the rice until almost tender, about 25 minutes, and add the spinach. Cook, stirring, until the rice is tender, about 5 minutes longer. You may not need to use all the liquid, or you may need to add more broth or some water. Stir in the remaining tablespoon of cognac, the Parmesan, and butter. Almost nothing works as well with mushrooms as Pinot Noir; they were made for each other. One from Oregon will accent fruitiness, while a basic Burgundy, also made from the Pinot-Noir grape, will be more herbal and earthy. Take your choice.